10% discount on total bill provided food is ordered. Offer valid 9am - 11am and 3pm - 5pm Monday to Friday. 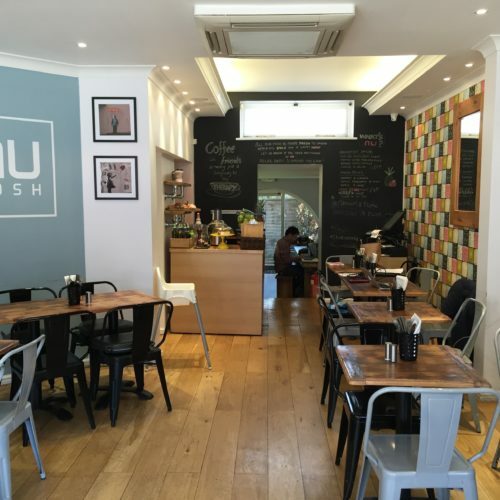 In a great location right in the middle of the busy shopping street in Temple Fortune, Nu Nosh is well placed for a pit stop any time of day. The large menu is focused on delicious, healthy options ranging from lots of breakfast items right through to salads or hot dishes at lunchtime or early evening, and there’s always a selection of delicious cakes to have with the (excellent) coffee or if you’re having tea. It’s a warm, bright place to sit and on sunny days there are tables outside.